Nat King Cole – American jazz pianist and vocalist. Father: Rev. 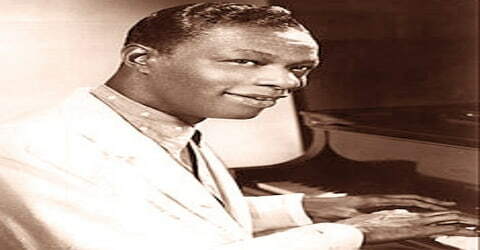 Edward James Coles Sr.
Nat King Cole, American musician hailed as one of the best and most influential pianists and small-group leaders of the swing era. Cole attained his greatest commercial success, however, as a vocalist specializing in warm ballads and light swing, was born in Montgomery, Alabama, on March 17, 1919. He recorded over one hundred songs that became hits on the pop charts. His trio was the model for small jazz ensembles that followed. Cole also acted in films and on television and performed on Broadway. He was the first African American man to host an American television series. He was a pianist, singer, and head of the band, ‘King Cole Trio’. He first gained fame as a jazz pianist and was known for his trademark soft, and baritone voice. He enjoyed an immensely successful solo career and his singles went on to peak the music charts. A prodigious child, he began learning to play the piano at the age of four and got formal training in music since he was 12. At the age of 15, he dropped out of school to pursue a career in the music industry. During his lifetime he encountered many instances of racism, especially during his professional tours and in one instance he was even attacked by a white supremacist group. In spite of facing criticism for not doing enough for the Civil Rights Movement, Cole strongly maintained his stand that he was more of a performer than an activist. 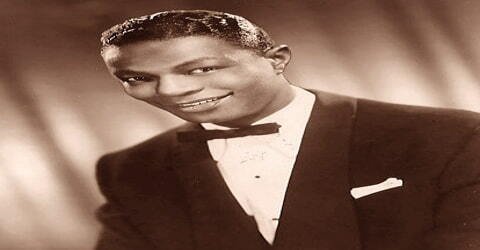 He created controversy when he hosted the TV variety series, ‘The Nat King Cole Show’. Instead, he had spent a decade as a celebrated jazz pianist, leading his own small group. Oddly, that was one source of controversy. For some reason, there seem to be more jazz critics than fans of traditional pop among music journalists, and Cole’s transition from jazz to pop during a period when jazz itself was becoming less popular was seen by them as a betrayal. At the same time, as a prominent African-American entertainer during an era of tumultuous change in social relations among the races in the U.S., he sometimes found himself out of favor with different warring sides. His efforts at integration, which included suing hotels that refused to admit him and moving into a previously all-white neighborhood in Los Angeles, earned the enmity of racists; once, he was even physically attacked on-stage in Alabama. But civil rights activists sometimes criticized him for not doing enough for the cause. 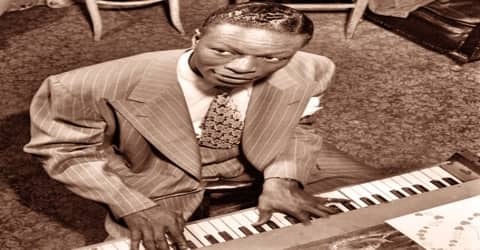 Nat King Cole, byname of Nathaniel Adams Cole, family name originally Coles, was born on March 17, 1919, in Montgomery, Alabama, to Edward Coles and Perlina Coles. He had three brothers and a half-sister. Each of the Cole brothers pursued careers in music. When Nat King Cole was four years old, the family moved to Chicago, Illinois, where his father, Edward Coles, became a Baptist minister. Cole learned to play the organ from his mother, Perlina Coles, the church organist. His first performance was “Yes! We Have No Bananas” at the age of four. He began formal lessons at 12, learning jazz, gospel, and classical music on the piano “from Johann Sebastian Bach to Sergei Rachmaninoff.” The Cole family moved to the Bronzeville neighborhood of Chicago, where he attended Wendell Phillips Academy High School, the school Sam Cooke attended a few years later. He participated in Walter Dyett’s music program at DuSable High School. He would sneak out of the house to visit clubs, sitting outside to hear Louis Armstrong, Earl Hines, and Jimmie Noone. At 15, Cole dropped out of school in order to pursue a career as a jazz pianist. For a brief period of time, he worked with his brother, Eddie, who helped him bag his first opportunity in recording in 1936. Cole met his first wife, Nadine Robinson, while they were on tour for the all-black Broadway musical Shuffle Along. He was only 17 when they married. 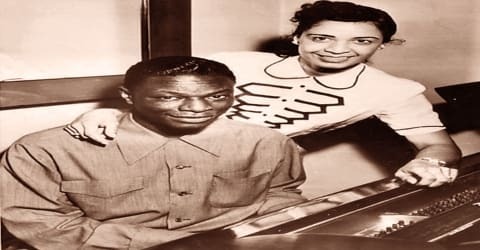 She was the reason he landed in Los Angeles and formed the Nat King Cole trio. This marriage ended in divorce in 1948. On March 28, 1948 (Easter Sunday), just six days after his divorce became final, Cole married the singer Maria Hawkins Ellington (she had sung with the Duke Ellington band but was not related to Duke Ellington). The couple had five children: Natalie (1950–2015), who had a successful career as a singer; an adopted daughter, Carole (1944–2009, the daughter of Maria’s sister), who died of lung cancer at the age of 64; an adopted son, Nat Kelly Cole (1959–1995), who died of AIDS at the age of 36; and twin daughters, Casey and Timolin (born September 26, 1961), whose birth was announced in the “Milestones” column of Time magazine on October 6, 1961 (along with the birth of Melissa Newman). Maria supported him during his final illness and stayed with him until his death. In an interview, she emphasized his musical legacy and the class he exhibited despite his imperfections. Cole had an extramarital affair with actress Gunilla Hutton, with whom he eventually lived. In 1937, after touring with a black musical revue, Cole began playing in jazz clubs in Los Angeles. There he formed the King Cole Trio (originally King Cole and His Swingsters), with guitarist Oscar Moore (later replaced by Irving Ashby) and bassist Wesley Prince (later replaced by Johnny Miller). The trio specialized in swing music with a delicate touch in that they did not employ a drummer; also unique were the voicings of piano and guitar, often juxtaposed to sound like a single instrument. An influence on jazz pianists such as Oscar Peterson, Cole was known for a compact, syncopated piano style with clean, spare, melodic phrases. Cole recorded “Sweet Lorraine” in 1940, and it became his first hit. According to legend, his career as a vocalist started when a drunken bar patron demanded that he sing the song. Cole said that this fabricated story sounded good, so he didn’t argue with it. In fact, there was a customer one night who demanded that he sing, but because it was a song Cole didn’t know, he sang “Sweet Lorraine” instead. As people heard Cole’s vocal talent, they requested more vocal songs, and he obliged. In 1939 and 1940, they made occasional recordings for small labels while expanding their live performing to include appearances across the country and radio work. In late 1940 they were contracted by Decca. Their 1941 recording of Cole’s composition “That Ain’t Right” hit number one on Billboard magazine’s Harlem Hit Parade (i.e., R&B) chart on January 30, 1943, Cole’s first successful record. By that time, Prince had left the group to work for the war effort, replaced by Johnny Miller. In 1941 the trio recorded “That Ain’t Right” for Decca, followed the next year by “All for You” for Excelsior. They also recorded “I’m Lost”, a song written by Otis René, the owner of Excelsior. During the late 1930s, the trio recorded radio transcriptions for Capitol. They performed on the radio programs Swing Soiree, Old Gold, The Chesterfield Supper Club, Kraft Music Hall, and The Orson Welles Almanac. The King Cole Trio’s contract with Decca expired before “That Ain’t Right” became a hit. Their next single, “All for You,” was recorded for the tiny Excelsior label in October 1942. After its initial release, it was purchased by Capitol Records and reissued. On November 20, 1943, it became the group’s second number one hit on the Harlem Hit Parade. It also crossed over to the pop chart. With that, Capitol signed Cole directly. The trio’s first Capitol session produced both the Cole composition “Straighten Up and Fly Right,” which topped the black chart for the first of ten weeks on April 29, 1944, spent six weeks at the top of the folk (i.e., country) chart, and reached the Top Ten of the pop chart, and “Gee Baby, Ain’t I Good to You,” which topped the black chart on October 21 and also crossed over to the pop chart. In 1946 the trio broadcast King Cole Trio Time, a fifteen-minute radio program. This was the first radio program to be sponsored by a black musician. Cole began recording and performing pop-oriented material in which he was often accompanied by a string orchestra. His stature as a popular star was cemented during this period by hits such as “All for You” (1943), “The Christmas Song” (1947), “(Get Your Kicks on) Route 66”, “(I Love You) For Sentimental Reasons” (1946), “There! I’ve Said It Again” (1947), “Nature Boy” (1948), “Frosty The Snowman”, “Mona Lisa” (No. 1 song of 1950), “Orange Colored Sky” (1950), “Too Young” (No. 1 song of 1951). Cole first recorded with a full orchestra (the trio serving as rhythm section) in 1946 for “The Christmas Song,” a holiday standard and one of Cole’s biggest-selling recordings. By the 1950s, he worked almost exclusively as a singer, with such notable arrangers as Nelson Riddle and Billy May providing lush orchestral accompaniment. “Nature Boy,” “Mona Lisa,” “Too Young,” “A Blossom Fell,” and “Unforgettable” were among his major hits of the period. He occasionally revisited his jazz roots, as on the outstanding album After Midnight (1956), which proved that Cole’s piano skills had not diminished. During the 1950s, Cole went on to pursue a career as a solo artist and soon became a successful one. He earned many hits like ‘Unforgettable’, ‘Too Young’, ‘Mona Lisa’ and ‘Nature Boy’. He soon managed to work with some of the biggest names in music like Louis Armstrong, Ella Fitzgerald, and Nelson Riddl. He also became friends with popular crooner Frank Sinatra. Cole often faced racism when he toured in the South. In 1956, while Cole was perfuming in Alabama in a mixed race concert, he was attacked by a group of white supremacists. He was often criticized for not taking a stand on racism-related issues but he always expressed that he was more of a performer and not an activist. He also struggled to find his way in the Civil Rights Movement. Throughout the 1950s, Cole continued to record hits that sold millions throughout the world, such as “Smile”, “Pretend”, “A Blossom Fell”, and “If I May”. His pop hits were collaborations with Nelson Riddle, Gordon Jenkins, and Ralph Carmichael. Riddle arranged several of Cole’s 1950s albums, including Nat King Cole Sings for Two in Love (1953), his first 10-inch LP. In 1955, “Darling, Je Vous Aime Beaucoup” reached number 7 on the Billboard chart. Love Is the Thing went to number one in April 1957 remained his only number one album. 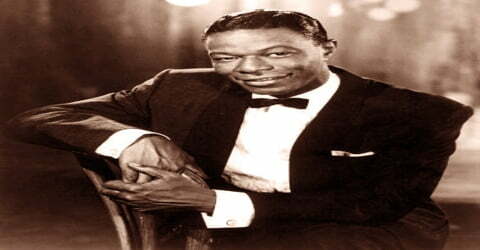 In 1956, Cole hosted the NBC show, ‘The Nat King Cole Show’. With this, he became the first African-American to host a variety series on television. 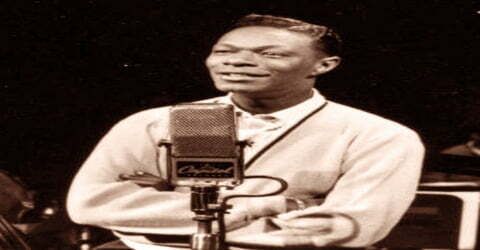 In 1957, after ‘The Nat King Cole Show’ went off the air, he was seen on ‘The Ed Sullivan Show’ and ‘The Garry Moore Show’. He was also seen on the drama ‘Istanbul’. In the late 1950s, his career in the record charts took a downward spiral. However, luckily, this did not continue for a very long time, as from the early half of the next decade his career took a good turn again. Cole sang at the 1956 Republican National Convention in the Cow Palace, Daly City, California, to show support for President Dwight D. Eisenhower. He sang “That’s All There Is to That” and was “greeted with applause.” He was also present at the Democratic National Convention in 1960 to support Senator John F. Kennedy. He was among the dozens of entertainers recruited by Frank Sinatra to perform at the Kennedy Inaugural gala in 1961. Cole consulted with President Kennedy and his successor, Lyndon B. Johnson, on civil rights. In 1958 Cole went to Havana, Cuba, to record Cole Español, an album sung entirely in Spanish. It was so popular in Latin America and the U.S. that it was followed by two more Spanish-language albums: A Mis Amigos (1959) and More Cole Español (1962). After the change in musical tastes, Cole’s ballads appealed little too young listeners, despite a successful attempt at rock and roll with “Send for Me”, which peaked at number 6 on the pop chart. Like Dean Martin, Frank Sinatra, and Tony Bennett, he found that the pop chart had been taken over by youth-oriented acts. In 1960, Cole turned his attention to the theater, putting together a musical revue intended for Broadway. The songs were by Dotty Wayne and Ray Rasch, and the album Cole made of them, Wild Is Love, became his first Top Ten LP in three years. The corresponding stage show, I’m With You, was not as successful, opening what was intended to be a pre-Broadway tour in Denver on October 17, 1960, but closing in Detroit on November 26. 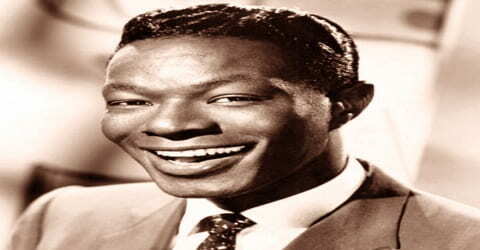 Cole, however, salvaged the concept of the show for a stage production he called Sights and Sounds: The Merry World of Nat King Cole, featuring a group of dancers and singers, with which he toured regularly from 1961 to 1964. Cole had greater success with concert performances during the late 1950s and early ’60s and twice toured with his own vaudeville-style reviews, The Merry World of Nat King Cole (1961) and Sights and Sounds (1963). His hits of the early ’60s “Ramblin’ Rose,” “Those Lazy, Hazy, Crazy Days of Summer,” and “L-O-V-E” indicate that he was moving even farther away from his jazz roots and concentrating almost exclusively on mainstream pop. Adapting his style, however, was one factor that kept Cole popular up to his early death from lung cancer in 1965. Nevertheless, Cole recorded some hit singles during the 1960s, including “Let There Be Love” with George Shearing in 1961, the country-flavored hit “Ramblin’ Rose” in August 1962, “Dear Lonely Hearts”, “That Sunday, That Summer” and “Those Lazy-Hazy-Crazy Days of Summer” (his final top-ten hit, reaching number 6 on the Pop chart). He performed in many short films, sitcoms, and television shows and played W. C. Handy in the film St. Louis Blues (1958). He also appeared in The Nat King Cole Story, China Gate, and The Blue Gardenia (1953). In January 1964, Cole made one of his final television appearances, on The Jack Benny Program. He was introduced as “the best friend a song ever had” and sang “When I Fall in Love”. Cat Ballou (1965), his final film, was released several months after his death. In 1959 Cole received a Grammy Award for Best Performance By a “Top 40” Artist for “Midnight Flyer”. Cole was posthumously awarded the Grammy Lifetime Achievement Award. He was also inducted into the Jazz Hall of Fame and the Hit Parade Hall of Fame. He was inducted into the Alabama Music Hall of Fame and the Alabama Jazz Hall of Fame. Cole was inducted into the Rock and Roll Hall of Fame in 2000 and the Latin Songwriters Hall of Fame in 2013. Cole’s success at Capitol Records, for which he recorded more than 150 singles that reached the Billboard Pop, R&B, and Country charts, has yet to be matched by any Capitol artist. His records sold 50 million copies during his career. His recording of “The Christmas Song” still receives airplay every holiday season, even hitting the Billboard Top 40 in December 2017. Around 1964, Cole was diagnosed with lung cancer. 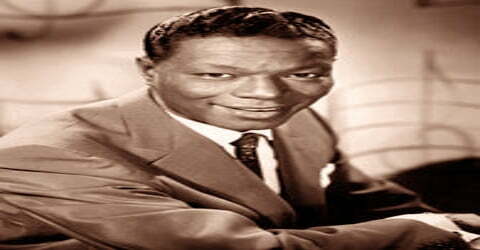 Nat King Cole died at the hospital early in the morning of February 15, 1965, aged 45. Cole’s funeral was held on February 18 at St. James Episcopal Church on Wilshire Boulevard in Los Angeles; 400 people were present, and thousands gathered outside the church. Hundreds of members of the public had filed past the coffin the day before. 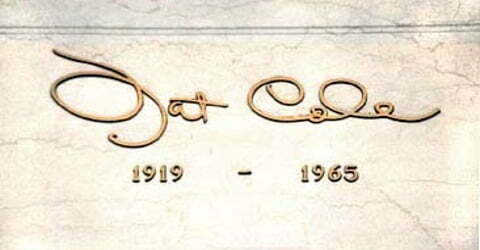 Cole’s remains were interred in Freedom Mausoleum at Forest Lawn Memorial Park, in Glendale, California. The song ‘Straighten Up and Fly Right’ is one of the most popular songs of the group, ‘King Cole Trio’. It peaked at the number one position on the Harlem Hit Parade and the Most Played Jukebox Hillbilly Records. His talents extended beyond singing and piano playing: he excelled as a relaxed and humorous stage personality, and he was also a capable actor, evidenced by his performances in the films Istanbul (1957), China Gate (1957), Night of the Quarter Moon (1959), and Cat Ballou (1965); he also played himself in The Nat “King” Cole Musical Story (1955) and portrayed blues legend W.C. Handy in St. Louis Blues (1958). His daughter Natalie was also a popular singer who achieved her greatest chart success in 1991 with “Unforgettable,” an electronically created duet with her late father. After his death, Cole continued to appeal to the two almost mutually exclusive audiences that had appreciated him during his life. Jazz fans continued to treasure his recordings of the 1930s and 1940s and to dismiss the non-jazz recordings he had made later. Pop fans clamored for reissues of Cole’s 1950s and ’60s music, awarding gold record status to compilations that Capitol continued to assemble, without much worrying about the singer’s talent as a piano player. (And, as his recordings fell into the public domain in Europe, where there is a 50-year copyright limit, a spate of low-quality reissues assumed flood levels.) But the ongoing debate was only testament to Cole’s ongoing attraction for music lovers, which, in the decades following his untimely end, showed no signs of abating.